”Crusher” Ground Combat Vehicle – FOP Shvachko V. V.
“Crusher” is an autonomous off-road Unmanned Ground Combat System developed by researchers at the Carnegie Mellon University’s National Robotics Engineering Center for Defense Advanced Research Projects Agency (DARPA), USA. The robot can travel over rough terrain, such as vertical walls more than 1.2 m high, wooded slopes, and rocky creekbeds. The “Crusher” has space frames (made of aluminum and titanium) and skid plates to protect the robot from heavy blows from objects like boulders. The “Crusher” has a hybrid engine capable of traveling several kilometers on one battery charge. The diesel engine then turns on to continue powering the “Crusher” and to recharge the battery module. The operators can drive the “Crusher” with video game controllers. While driving between its waypoints via GPS, the “Crusher” continuously attempts to find the fastest and easiest path to its destination. The “Crusher” can be used for a number of missions considered highly dangerous for soldiers: fire support, reconnaissance, sentry, supplying etc. 1. Crusher Overview. – Mode of access: http://www.rec.ri.cmu.edu/projects/crusher/. 2. UPI: UGCV PerceptOR Integration. – Mode of access: http://www.rec.ri.cmu.edu/projects/crusher/Crusher_Brochure.pdf. 3. Crusher (robot). – Mode of access: http://en.wikipedia.org/wiki/Crusher_%28robot%29. 4. Crusher. – Mode of access: http://www.youtube.com/watch?v=hPL-gM1WbAQ&feature=related. 5. The Crusher. – Mode of access: http://www.youtube.com/watch?v=Q0p-7eX0_xM&feature=related. 6. Crusher Unmanned Ground Vehicle- Testing Highlights. – Mode of access: http://www.youtube.com/watch?v=dluiPYDDbtw&feature=related. 7. 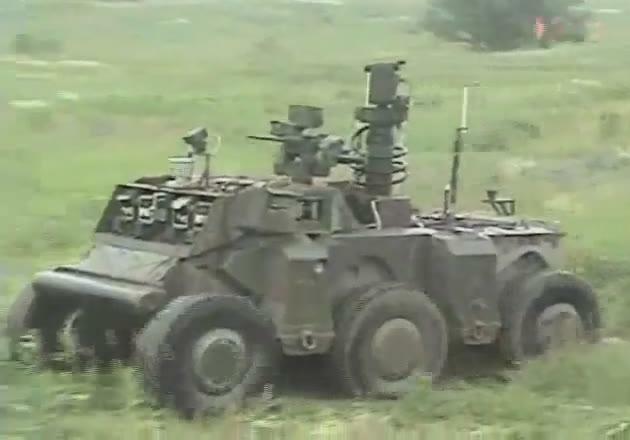 Raw Video: Army ‘Crusher’ Robot in Action. – Mode of access: http://www.youtube.com/watch?v=EjpH7ig0rKo. 8. CRUSHER: CMU’s Robotic Tank-Mobile. – Mode of access: http://www.youtube.com/watch?v=EZtlTHEHj4M. 9. Ultimate Weapons- The Crusher. – Mode of access: http://www.youtube.com/watch?v=WOD5NF48byo&feature=related. 10. NWO TERMINATOR. – Mode of access: http://www.youtube.com/watch?v=R-Pdb_DyoK8&feature=related.